Nissin Japan Limited (Chairm an Mr. Goto Chikara) proudly announces the Air10s, an advance NAS (Nissin Air System) 2.4Ghz Wireless TTL commander for Fujifilm, Sony, Micro Four Thirds, Canon and Nikon cameras, available in April 2017. The device’s range of use has been greatly extended (when compared to older models) to a maximum distance of 100 meters, and the TTL Mode, high speed sync (FP sync) supporting up to 1/8000 High-speed shutter speed, rear curtain, and other functionalities can be controlled remotely. The de vice has a “TTL Memory Function”, which memorizes the exposure during a TTL Mode shoot, and allows for a one-touch switch to manual mode. You can save time during the strobes setup as the device takes the TTL exposure data, calculates the individual output internally, and transforms the exposure data into manual mode for advance adjustment. 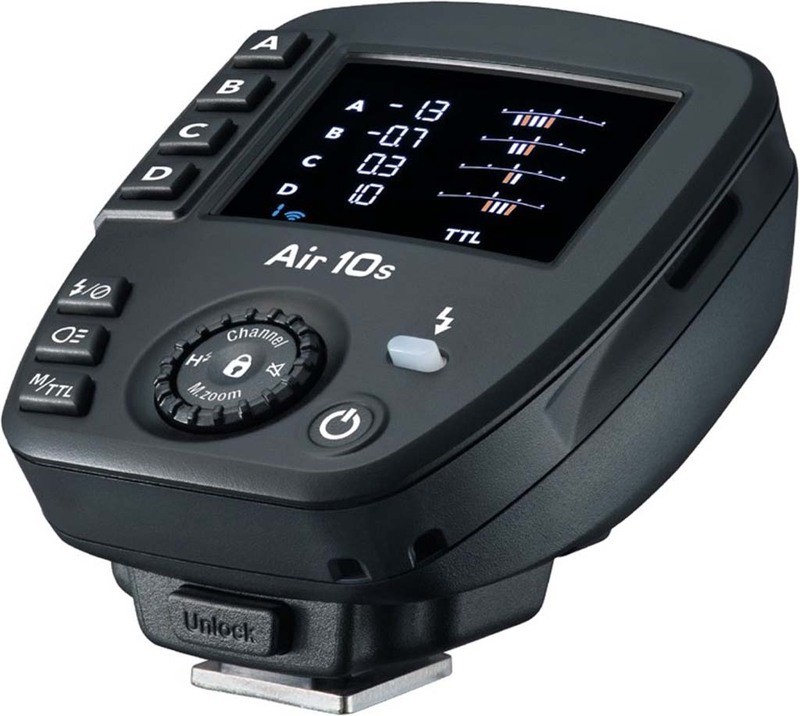 Even if your Air 10s is for Sony Mount, it is possible to pair it with Canon, Nikon and other differing version of NAS strobes (i60A, Di700A), and you can retain use of all the functions, including TTL Mode(Applies to the other type of Air10s versions as well). *1 NAS stands for Nissin Air System, a proprietary wireless TTL communication system developed by Nissin for 2.4GHz radio transmission that allows for stable operation of slave strobes in outdoor or environments that may have other disturbances. Devices are paired beforehand to ensure stable communication with each other, and to avoid signals from getting mixed up, 8 channels have been set up, providing a secure communication environment. *2 For Canon Mount devices that are set to Mode II, the rear curtain sync function cannot be used. *3 Only supported on i60A. When the device is paired with Di700Aor AirR, the TTL is -2.0~2.0EV, 1/2EV step, in Manual it is 1/1 – 1/128, 1EV step. *4 When using in Open Mode, the NAS strobe’s firmware needs to be updated. This entry was posted in Accessories and tagged Nissin, Nissin Air 10s. Bookmark the permalink. Trackbacks are closed, but you can post a comment.